Because legendary bandleader Tommy Dorsey had so many popular hits during the 1930s and '40s, his later work has been, comparatively, ignored or dismissed. But the 70 choice selections here, each one recorded with fine musicianship and in great sound from 1950 to 1953, show that Dorsey was still a formidable trombonist and innovative musician. Besides "Opus Number Two" and "T.D. 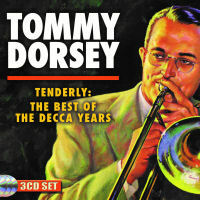 's Boogie Woogie", swinging follow-ups to past successes, two new versions of Tommy's theme, "I'm Getting' Sentimental Over You," one with a chorus and the other with only the trombone section, piano, and bass (never before on CD); and choice jazz by Dorsey's Clambake Seven, this retrospective includes five complete 10" Decca albums: "Ecstasy: Tommy Dorsey Trombone Solos," "Your Invitation To Dance: Classic Dances in Modern Dance Tempo," "Tenderly: Love Songs in Waltz Time," "In a Sentimental Mood," and "You and The Night and The Music: Tommy Dorsey plays the musical comedy hits of Howard Dietz and Arthur Schwartz." Enhanced by interesting notes, full personnel and recording session information.